On the evening of May 28, 1910, the balloon Springfield, took off from the Court Square extension in the city of Springfield, Massachusetts, with five men aboard. The trip was reported to be “another comet party”, presumably to observe Halley’s Comet which was present in the nighttime sky at that time. The pilot was J. B Benton, of Boston. Passengers included David P. Todd, a professor at Amherst College; two Amherst students, Robert Wells of Paris, France, and Nelson Waite; and Boston businessman Louis Dederick. 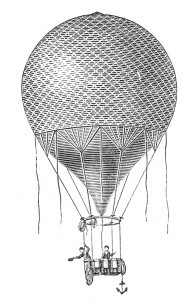 The balloon lifted slowly upwards as it drifted towards the railroad tracks of the New York, New Haven & Hartford Railroad. While only about twenty feet in the air, the balloon lines leading from the passenger gondola to the balloon netting got snagged on wires suspended over the tracks. The balloon was now bobbing above the wires while the gondola with its cargo was left helplessly dangling beneath, directly over the tracks. A crowd gathered as the occupants struggled to free the lines, but before much could be done, the sounds of an approaching express train could be heard. The train showed no signs of slowing as it approached, but fortunately it only grazed the gondola as it sped past and continued on its way without stopping. After recovering from what they thought was their certain end, the men decided to abandon their plans for a balloon flight for that evening.